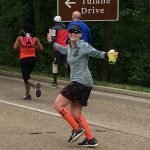 You are here: Home / Race Report / State #11: Alaska! In addition to my 11th state race report, this is my “Half minus a Half” race report for G and my snapshot of my run for Tonia. 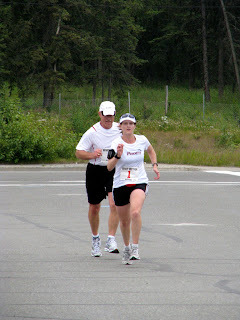 Once we set our dates for our Alaska trip, I started looking for a race we could do while there. The only race that was near where we were going to be was the Soldotna Unity run. 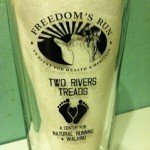 It had two options – a 5k and a 10 miler. I’m trying to avoid 5ks to the extent possible for my state races, so that left us with the 10 mile option. In past years, about 30-40 people run the 10 miles and this year was no different. I consider myself a “middle of the pack” runner, but that was not the case here. Apparently, only the fast runners run 10 miles. 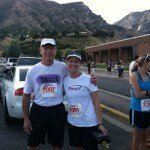 I finished 18th out of 23 women and my dad was 15 out of 15 men. So, I finished in the top 20 of women, but there were only five people after me! It was really chilly. 48 degrees and cloudy. I couldn’t decide whether to run with my windbreaker or not. I ended up not taking it, which meant I was FREEZING at the start line, but I ended up being glad I didn’t have it. Note my race number. This may be the only time in my life I get a single digit number LOL. The gun went off and we watched all except two of the runners head out of sight. We had a plan and refused to be pulled out too fast, despite feeling REALLY slow. Mile 1 (9:30): Nice, easy mile. I finally got warm enough to stop shaking. Mile 2 (9:28): Another nice easy mile, although we were afraid we were going a little fast. Mile 3 (9:42): I grabbed a bottle of powerade and ran with that for a while. Disposing of it slowed me down a bit. Mile 4 (9:37): Still right where we wanted to be. Mile 5 (9:29): We figured this would be our last “fast” mile as we were about to hit some wicked hills. Mile 6 (9:30): Surprisingly, we managed to keep a decent pace while going up and then flew down the hills, so they didn’t kill our average speed. Mile 7 (9:29): Recovering from the hills. I turned around and tried to get a picture of the temperature on the sign, but was too far away. Mile 8 (8:55) I was feeling awesome and we passed a couple of people. By this point, we’d passed four people and there were two others behind us from the beginning. Mile 9 (9:22): My dad’s hamstring went from unhappy to angry, so we pulled back a little bit. All in all, it was an awesome race. It was well organized, there was a cookout at the end, and I got to run (almost) 10 miles with my dad. It was also a major confidence booster for me. 9:30 was an easy pace and even the 8:55 mile wasn’t that hard, despite being 7 miles into the race. The heat in Virginia has totally sapped my abilities, so I’ve been questioning my fitness. This race proved to me that the heat is the issue, so as long as I keep running, I should be great once it cools back down. Great job on the race! It is awesome that you get to run with your dad. are you seriously bibs #1 and 2? so funny! 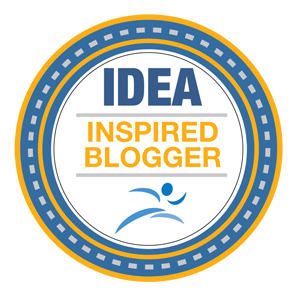 I love this post and it gives me hope that when I escape the heat of VA for the cool Indianapolis fall, I will rock my marathon! Nice bib numbers!! Congrats on your 11th state. That cool Alaskan air must have felt sooo nice! I'm ready for October. Congrats on a strong race and another state! Even though it was chilly, sounds like a perfect break from the summer heat. Oh those conditions sound heavenly right now in this brutal heat and humidity. So cool that you got run in Alaska!. I should totally look for races when travelling..never really did that before 🙂 yey for a dad and daughter run, awesome! 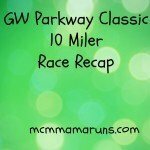 Congrats on the 10 miler! You did great! Very cool you got to race in Alaska and with your dad! Congrats to you and your dad on your race. How fun! and thanks for giving us a check on running in the cool air after being sapped for so long from the heat! Gives me hope for the fall! Great job on starting slow and finishing fast! Great photos!I love that you and your dad raced together. Bib#1 and #2 That was great!congrats on another state done. Congrats on the 10-miler with your dad! What a wonderful memory! Congratulations! So cool that you were able to knock another state off. I once traveled to a race out of town and preregistered online. 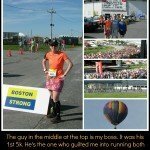 When I got there, I was #2 and probably the only one to have done so out of the 50 runners. But I went on to win the 5k! In a blistering 24 minutes. It counts. So great that you got to run with your dad! I love that you were race numbers 1 & 2. How cool that you got to race while there! And with your dad, too–what a great experience that must have been. No moose? Congrats on the run and the additional state. 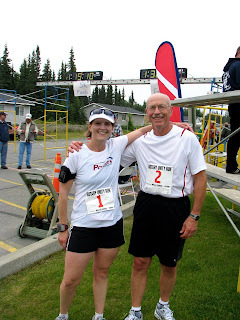 so cool you got to run with your Dad!Yay Alaska! Great job! You will definitely feel so much better in the fall and having stayed the course through the summer, you'll be stronger, no doubt! Fantastic job on your race – loved all the pics, especially the ones of you and your dad. What wonderful family time! I'm so excited to see another state colored in on your map! It's beyond cool that you run with your dad. A chilly run sounds like heaven about now! ugh, my heart hurts so much when i look at pictures of Alaska!! it's weird, i've never felt like that about any place i visited before. I felt a hole in my heart when i left AK, i want to go back SOOOOO badly!!! SOOOOO cool that you got #1 and 2!!! 🙂 take more pics and post them!!!!! 🙂 HAVE FUN!! Nice race with your dad! What state is next? That is awesome! That's really sweet that you got to run a race with your dad! T & I were just talking about that this morning, the heat makes you question your abilities. "I know I can run a 9m/mi for 10 miles… so how come I'm struggling these days to run a 10:30?" Thanks for that awesome recap, and the photos, and no, I will never get tired of looking at your vacation photos. Ever. Awesome race and congratulations . . .it makes me long for running in cooler weather, but sadly that's months away for me. So awesome you share this with your dad!